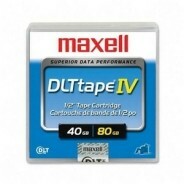 Maxell DLTtape offers high capacity storage up to 80GB with data compression, withstands high speed streaming speeds up to 150 ips and offers data transfer rates up to 12.0 MB/second. Thanks to Maxell�s patented Ceramic Coating process, Maxell DLTtape is rated at a minimum of 500,000 passes with 30+ years archival life. Maxell DLTtape is perfect for hierarchical storage management, backing up LAN servers, workstations and midrange systems and DVD mastering. All Maxell DLT tape cartridges have a factory security seal which ensures the product is genuine, new and direct from the factory.